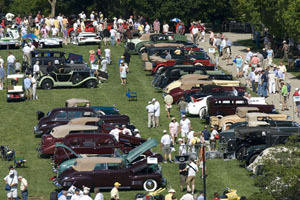 What is a Concours d'Elegance car show? A formal display of antique and classic cars grouped by style or make that undergo precise judging to determine the best in class. Extraordinary collectible cars presented in an exceptionally social setting. An auto show conducted for the purpose of raising funds for charity through ticket sales, social events and driving tours. An elegant car show where the cars are invited by a selection committee to most accurately represent a style, theme, marque or special display. A gathering of up to 200 or more accurately restored or original condition cars, usually held at a nicely landscaped or spectacular location such as a park, golf course or estate. A Concours d’Elegance (from French meaning a competition of elegance, lit. “concourse of elegance”, referring to the gathering of prestigious cars) dates back to 17th Century French aristocracy, who paraded horse-drawn carriages in the parks of Paris during Summer weekends and holidays. Over time, carriages became horseless and the gatherings became a competition among automobile owners to be judged on the appearance of their automobiles. Concours d’Elegance (properly pronounced kon-koor del-i-gahns) events began over 100 years ago in the parks of Paris, the Riviera and other elegant towns of Europe. The rich and famous of European society gathered to socialize and celebrate, as unique forms of art, the latest automobiles as well as the latest of women’s fashion and design. These gatherings were called Concours d’Elegance, which term conjures up romantic visions of beautiful women in haute couture in a park like setting surrounded by sparkling automobiles. The early Concours were leisurely social affairs, where lighthearted competitors were rewarded with rosettes. However, man being the perpetual competitor, these events became more defined as time went on.Trained judges examine each vehicle thoroughly and in its entirety. They rate each and every component. Only those vehicles that are perfect examples are judged as Concours quality, and are considered eligible for a class trophy. “كونكورز دي اليجانس” للسيارات الفارهة هي حدث عالمي تتنافس فيها السيارات الكلاسيكية من حيث جمال االتصميم والاناقة.بداية المسابقة كانت في فرنسا فترة العشرينات من القرن الماضي، فبعد ان اصبحت باريس العاشقة للفن عاصمة العالم للثقافة،اصبح الناس مفتونون ببذخ عالم السيارات وخصوصا الدوائر الاجتماعية الراقية في المجتمع الباريسي والذين انجذبوا الى السيارات الانيقة واحدث صرعات التكنولوجيا.